I’m frequently asked about the differences between seats and systems of riding. One question is sort of like the “chicken or the egg’. 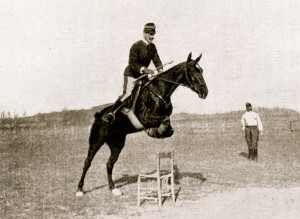 Is Balanced Seat the result of a dressage seat with forward seat added to it? Or is it the result of forward seat with dressage added to it? My personal experience is the latter. So there you have it: The Chicken or the Egg. Now for my simplest answer. 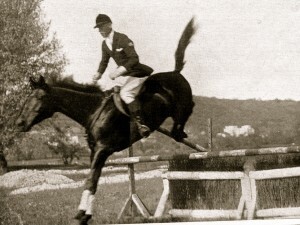 The freedom of the horse’s head and neck, free forward movement, forward balance, shorter stirrups, and forward position over the jumps are from Caprilli. These are the things that took jumping from the backward seat to the forward seat. The use of seat, use of leg aids, flexion, bending, lateral movements, balancing of the horse and flexions of the pole and jaw are from classical training or dressage. Would you like to receive interesting articles from U.S. Horsemanship right in your inbox?? Find out about the advantages of signing up to receive the U.S. Horseman Updates by clicking on the subscribe page. Or you can sign up directly by filling out the form on this page.